The best infographics are like good novels: They grab you by the collar, transport you to another world and refuse to let go until the real world steps in and gives you a rude awakening. This is how I felt when I picked up Gareth Cook’s The Best American Infographics 2015, the third volume in a series of infographic compilations. Like an avid reader absorbed in a gripping tale, I found myself poring over these visual stories, eager to distill the meaning contained within each of them. From breath-taking illustrations to ingenious visualizations, these beautiful data worlds introduced me, in each case, to a reality I didn't know existed. At first glance, they might seem like abstract eye candy, but if you take the time to delve into each of them, they can change your perspective of the world like nothing else can. In an interview with Quartz, Cook explained the reasons behind the series. Besides encouraging readers to look at infographics critically, he also wanted to reveal the sheer communicative power of infographics. As a journalist who’s written about complex topics such as nanotechnology, he’s relied more than once on his design team to come up with a visual concept that would succinctly explain it in a very simple but effective manner. Maria Popova, creator of the popular blog on eclectic subjects Brain Pickings, introduces the book with an insightful commentary on what characterizes the best infographics. Rather than get sucked into the trend of trivializing information and making readers “lazy” by spoon feeding them bite-sized chunks of data, Popova explains that the best infographics do precisely the opposite: They stimulate readers’ minds and encourage them to look deeper for hidden truths. 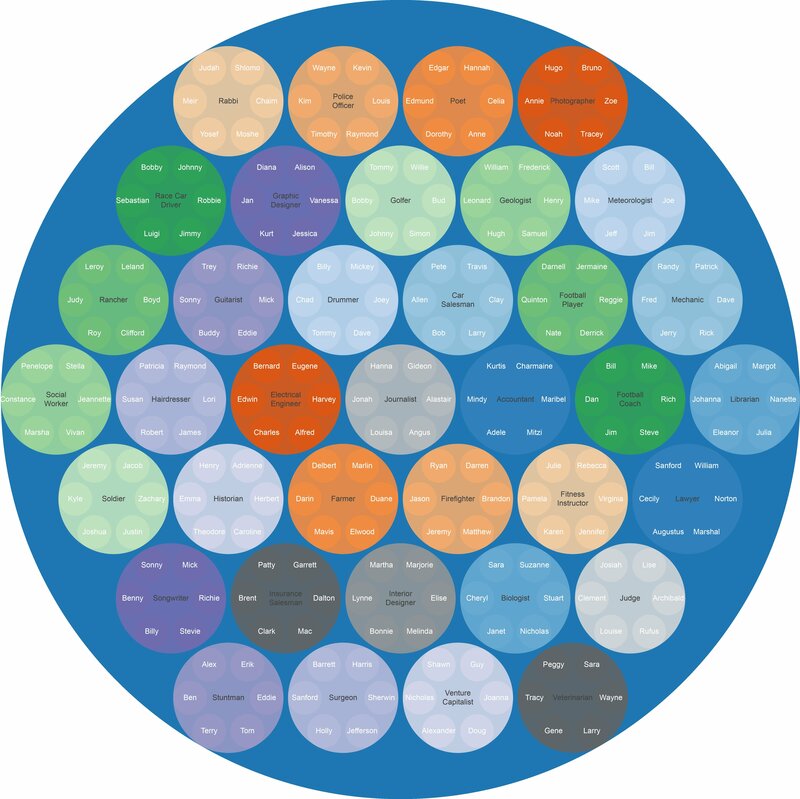 One of the most entertaining pieces was Mark Edmond’s “Names By Profession.” This interesting data visualization displays the most common names in several professions. Intrigued by the hidden trends behind these names, we’ll probably recall having met a librarian named Eleanor or a car salesman named Larry and wonder why these particular names are linked to these specific occupations. 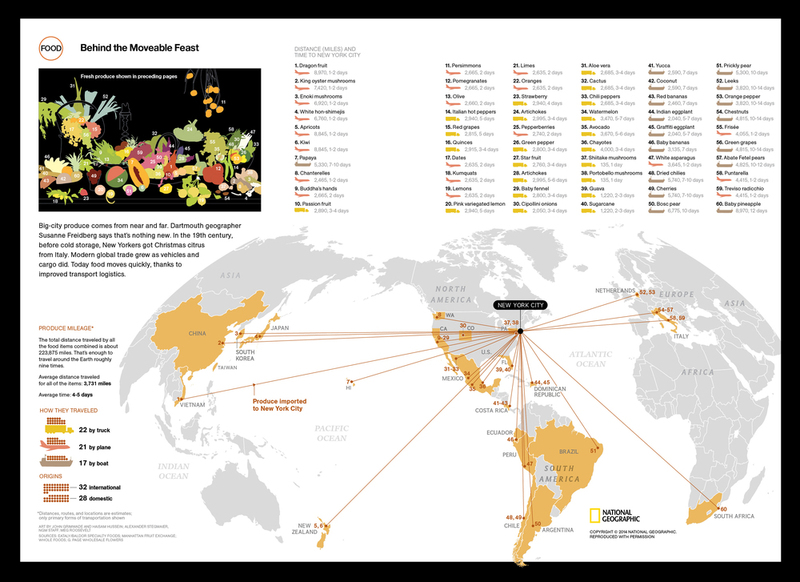 Created by the design team at National Geographic, one of the master conceptualizers of stunning infographics, this data visualization looks more like a 17th-century painting that an infographic at first sight. 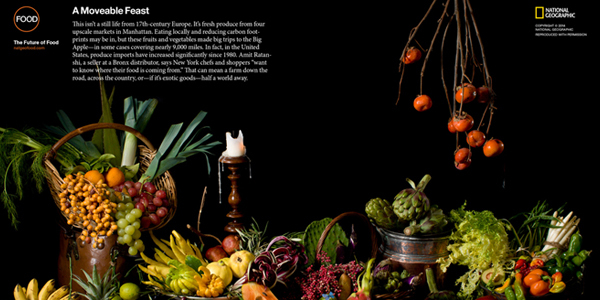 It is really a modern-day image of fresh produce from four high-end Manhattan markets. Many of them were imported from halfway around the world, sometimes making trips as long as 9,000 miles. 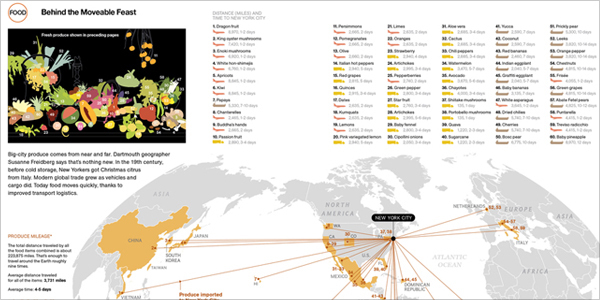 The purpose of the second page of the infographic is to drive home the message that much of our produce makes big trips to get to our local markets; in this case, the combined distance traveled by all these products sums up to a grand total of 223,875 miles, which is the equivalent of traveling around the Earth nine times. Like all good infographics, this one effectively shifts the way we perceive reality and, in this case, the food that we consume daily. This infographic published by the Washington Post is another one that will absorb your attention and shed light on reality in an unsettling way. The objective of its creators was to “shock the senses” of Americans after witnessing one mass shooting after another. 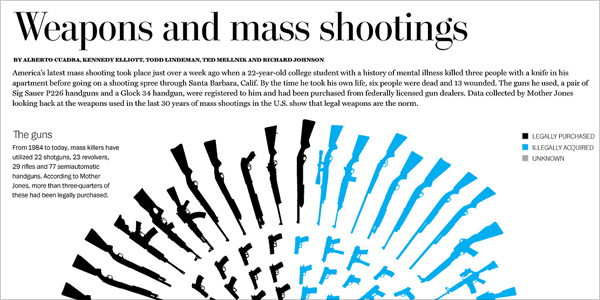 An accurate depiction of each of the guns used in the mass shooting of the last 30 years, this visualization clearly gives the reader a ton of information in a single glance. Just by looking at the circular graph, you not only decipher that roughly three-quarters of the guns had been legally purchased, you also see each of the guns used in careful detail. Part of a series of line graphs, these visualizations are meant to collectively reveal how misleading--and humorous, in these cases--it is to assume that correlation means causation. 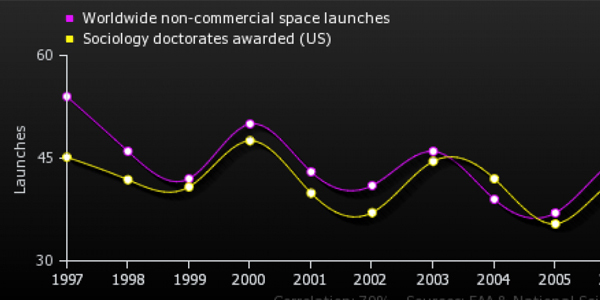 Take, for example, the above graph of the number of worldwide non-commercial space launches and the number of sociology degrees awarded. Of course, it would be absurd to conclude from this graph that the two are somehow related. 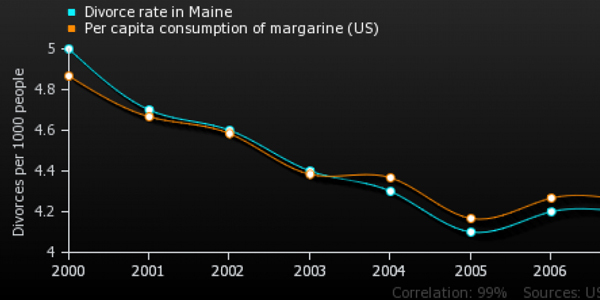 Another curious example is the graph of the divorce rate in Maine and the national per capita consumption of margarine. Again, there is a strong correlation but--most certainly--no causation involved. How much of your life do you spend--or waste--in traffic? This is the question that the design team at National Geographic set out to answer with this unique and artfully created infographic. 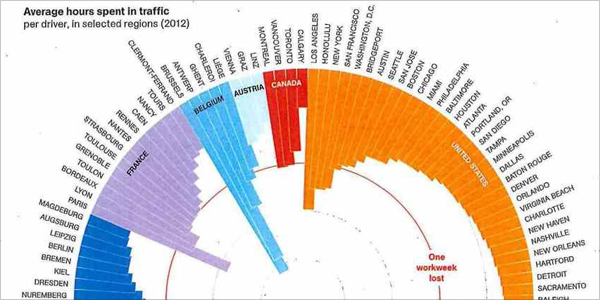 In less than a minute of viewing and interpreting the visual data, you’ll find that you have a good overall sense of the most congested cities and how they compare to others around the world. 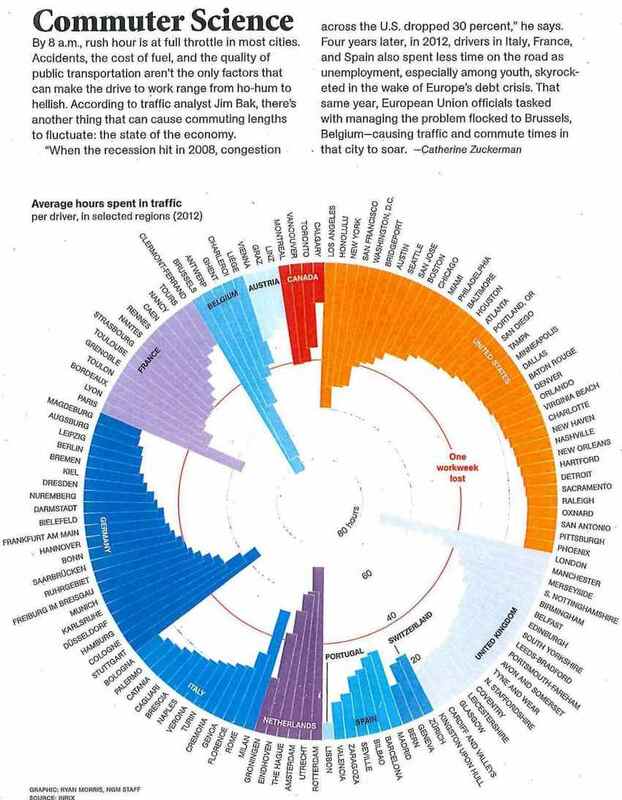 Did you know, for example, that every year in Brussels, commuters lose the equivalent of two work weeks in traffic, more than commuters in any other part of the world? The mark of a successful infographic is the way it enables you to see the world through a different lens. 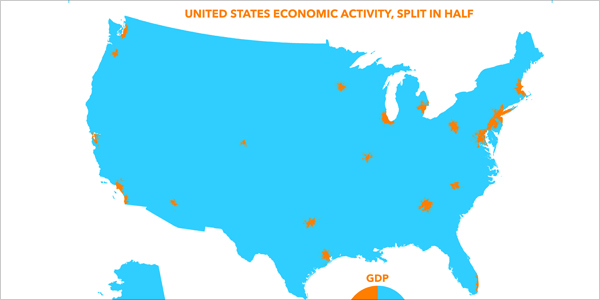 This map does just that by revealing just how concentrated the nation’s economic resources are in a few urban areas of the country. 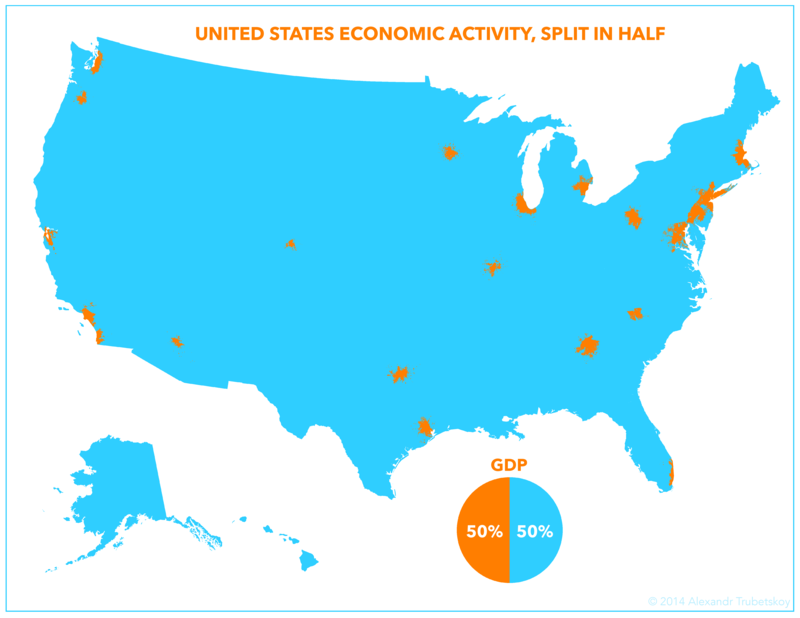 Although simple in its appearance, this infographic tells a story and triggers a variety of emotions in its viewers (surprise, curiosity, anger) by revealing just how lopsided the American economy really is. 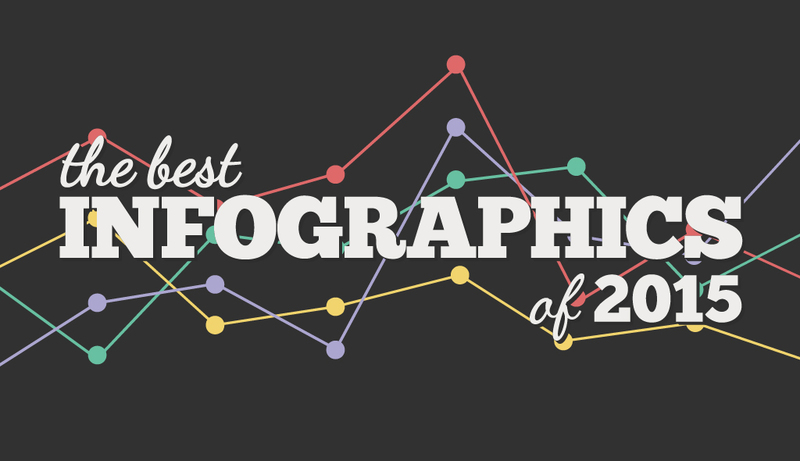 This visualization is another example of an infographic that amazes, appalls and intrigues at the same time. 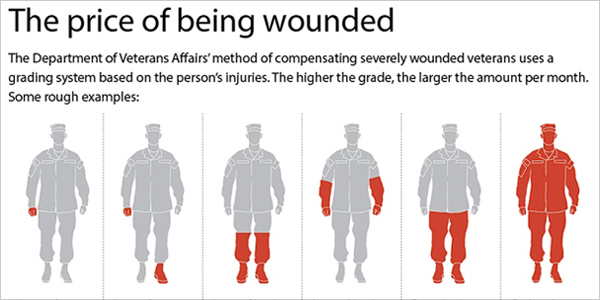 A visual representation of the amount of compensation received by wounded veterans--based on a grading system of the person’s injuries--this infographic reveals the ugly truth behind this reality: Each bodily part has actually been assigned a monetary value by the Department of Veterans Affairs. Losing one hand, for example, is worth $100 a month, while losing both legs is worth $1,000 to $1,300 per month. One of the most stunning infographics you’ll see this year is this piece published in ESPN The Magazine. Intended to give readers a glimpse of the degree of uncanny athleticism they would be witnessing at the 2014 Sochi Olympics, this visualization depicts every step of a throw quadruple salchow jump. The effectiveness of this infographic lies in the fact that it reveals the astounding complexity of these types of athletic feats, which are made to look easy and effortless by these star athletes. 9 What Do Americans Speak? 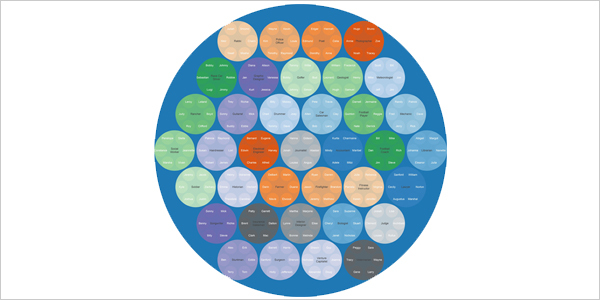 What are the most spoken languages in the US? After naming English and Spanish, most people will likely be stumped by this question. 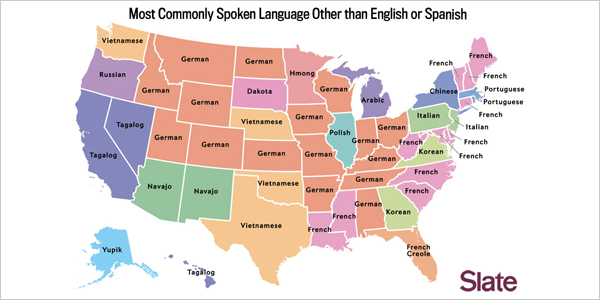 To reveal the answer to this question, Ben Blatt from Slate created a series of maps with color coded states depicting the most commonly spoken languages after English and Spanish. The results, in some cases, are surprising. This interactive piece is truly ingenious in the way it helps you visualize the most used colors in certain movies. 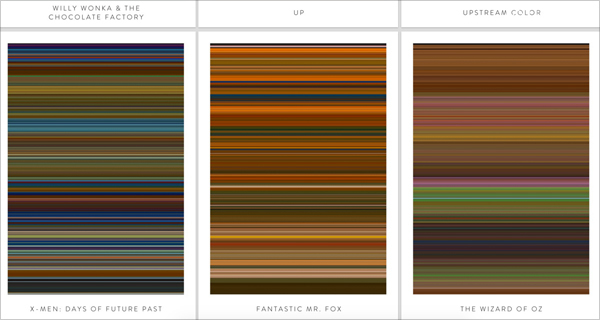 In order to strip away everything except the color from each film, interactive designer Charlie Clark used a program that processes movie files to find the average color of each frame, which is then depicted as a horizontal stripe. If you take the time to really delve into the data of these interactive infographics, have a good look at this one. 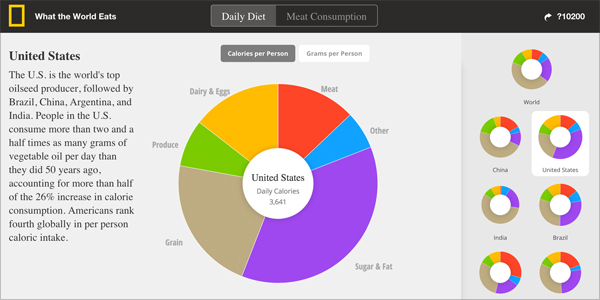 A highly revealing piece, it condenses tons of information into 5-second animations that reveal the hidden patterns behind the evolution of food consumption habits over the last 50 years across 22 different countries. From Cuba’s fluctuating caloric intake to Saudi Arabia’s 16-fold increase in meat intake, each interactive graph has its own story to tell. Like the previous piece, this animation condenses hundreds of years’ worth of data into just a few minutes. By tracking the births and deaths of 100,000 notable people from 600 BC to present day, the creators of this stunning animation set out to chart their migration patterns and, in doing so, visualize the changing locations of intellectual hotspots around the globe. Using arcs that turn from blue to red to distinguish birthplaces from death locations, the creators were able to visually represent the rise and fall of empires and cultural centers across several centuries. Now that you've seen a few inspiring infographics, you can access all our tips on how to create an effective infographic (from how to write content for your visual to the design process) in our free e-book below. Thank you for the feedback, Martin. This one is also very creative and interesting. I didn’t agree with #3 – All The Guns. When I looked at the graphic showing the guns, my vision picked up a 50-50 split at first glance. As I looked more at it, I could see it being closer to 60-40 maybe. 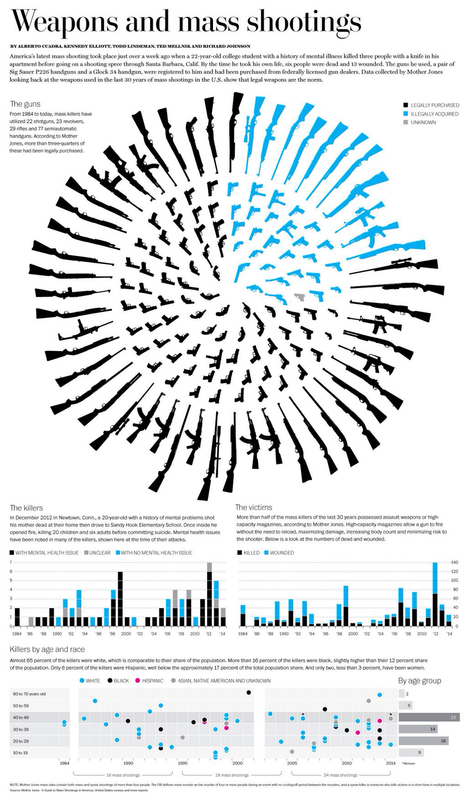 If I have to count all the guns to get the correct message, is it really a good graphic? The others here portray the data in ways I can quickly pick up the message. Thanks, I do enjoy looking through these for new ideas. Thanks for the feedback, Chris. Perhaps this is because the image was originally linked to only part of the infographic. It has been updated now, so you can take a look at the complete infographic. This may help to get a better overall sense of the data. OK Now I agree with you about the graphic. 🙂 I had tried to see the source before when I commented. Take care and have a great year.